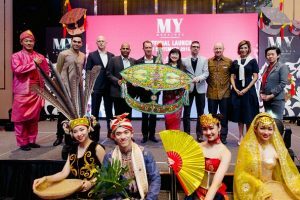 Marriott International has re-imagined the art of doing business with inspiring meeting spaces given a Malaysia-centric makeover with the launching of“MY Meetings by Marriott International”. Connecting the many facets of authentic Malaysian culture with enriching themed meeting packages, 17 participating Marriott International hotels and resorts in Malaysia has carefully integrated localized elements into custom meeting packages for international groups that serve as a window into the country’s rich culture and cuisine. Whereas local delegates can look forward to surprising twists that will evoke a nostalgic flavour. The official launching of “MY Meetings by Marriott International”: (R-L) Doris Chin, general manager of Element Kuala Lumpur; Michelle Caporicci, managing director of The St. Regis Langkawi, The Westin Langkawi Resort & Spa and LICC; Chris Moore, general manager of Sheraton Petaling Jaya Hotel; Sho Hwee, Marriott International, Area Director of Sales & Distribution – Singapore, Malaysia & The Maldives; Ko Van den Hil, general manager of The Westin Kuala Lumpur; Kumar Renoo, general manager of Le Méridien Putrajaya and Four Points by Sheraton Puchong; Christian Metzner, general manager of W Kuala Lumpur and; Nicolas Kassab, Marriott International, Area Director of Operations, Singapore, Malaysia and Maldives. “The ‘MY Meetings by Marriott International’ concept aims to showcase authentic, experiential options that elevate Malaysia’s colourful culture, food and heritage with a more enriching experience for business meetings in our Malaysia hotels and resorts. At the same time, international guests will find the many unique cultural facets and contrasts, making Malaysia an ideal destination for meetings,” said Sho Hwee, Marriott International, Area Director of Sales & Distribution – Singapore, Malaysia & The Maldives. Malaysia offers unique locales for meetings, ranging from Kuala Lumpur’s urban vibrancy to the lush scenery of Langkawi or Sabah. Delegates can look forward to immersing in a host of captivating cultural elements and creative touchpoints highlighting local values. Meetings are made easy in Malaysia’s vibrant capital, Kuala Lumpur, with world-class transportation links and a thriving business community. Industry-leading innovators rub shoulders with traditional cultural values allowing a plethora of options for injecting a Malaysian cultural flavour into meetings. As the country’s hub of arts, cuisine and entertainment, the options for contemporary experiential themes in meetings is virtually unlimited. The “Joms Lokal” meeting packages are designed to connect and spark creativity in a sleek meeting space, fuelled with tempting tea time bites including authentic Nasi Kandar, Roti Jala and Kuih Muih local sweets, as well as timeless sundry shop titbits. Group breakout sessions become even more enriching with a live action Teh Tarik stall. For additional inspiration, take your group into the Backyard area or the roof top level Cigar Lounge amid captivating skyline views of Kuala Lumpur. Price starts from RM169+ per person for ‘Joms Lokal Second Leg’ (half day w/o lunch), RM199+ per person for ‘Joms Lokal First Leg’ (half day with lunch) or go for ‘Joms Lokal All The Way’ (full day) at RM229+ per person. For more information, email: aloft.kualalumpur@alofthotels.com or call +603 2723 1188. The meeting experience can be elevated to new heights in one of the tallest buildings in Malaysia providing appealing skyline views. Element Kuala Lumpur presents a bright, open space bathed in natural light with interactive Malaysia themed elements to spark the imagination and fuel those creative brainstorming sessions. Curate a themed table set up with authentic local food and inject Malaysian cultural flavours into your meeting. A full day meeting is priced at RM198 nett per person whilst the half day meeting package is at RM165 nett per person. For more details email: sales.elementkl@elementhotels.com or call +603 2771 3388. Le Méridien Kuala Lumpur brings a touch of timeless nostalgia to meetings, taking attendees back to the past, evoking the cultured post-colonial days of old Malaya. It is a seamless blend of old and new with high-tech ‘architecture lightings’ in the pillar-less Clarke Ballroom which can project customized multi-coloured images based on the specific meeting theme. This engaging setup is designed to rediscover old world charm which in turn, can help inspire modern day innovation. It includes live stations to witness the art of handcrafting Peking duck pancake and popiah to name a few. The interactive kitchen will enhance any coffee break experience with local snacks, candies and ice-cream potong. Priced at RM260+ for full day package (weekdays), RM240+ for half day (weekdays) and RM240+ for full day (weekends), RM220+ for half day (weekends). For more information, email: sales.lmkl@lemeridien.com or call +603 2263 7888. ‘Meetings Kaw-Kaw’ offers a fully customized destination meeting featuring creative options for a quintessential Malaysian experience. Be it indoors or outdoors, engage delegates with a ‘Little India’ inspired ‘Banana Leaf Rice’ lunch break or vibrant night market themes with live cooking stations. With function space of 40,000 square feet spread over 4 floors, every component can be fully tailored from inspiration to implementation, for conferences, seminars, and meetings of any size. Package priced at RM220nett per person per day. For more information, email: rhi.kulrn.sales@renaissancehotels.com or call 603 2716 9397. The hotel vividly showcases the nation’s multicultural melting pot through immersive cultural concepts and cuisine from the different regions in Malaysia including Nyonya, Kelantanese and Melaka Portuguese. Attendees can embrace the dynamic theme of ‘Truly Malaysia’ as a shared experience, and so foster closer ties with their peers. A host of additional elements are offered to liven up any business gathering such as a cultural dance performance and a live cooking demo of local favourites. The hotel also presents an unforgettable way to conclude a productive day of business with an indulgent ‘Sky’s the Limit Meeting Dinner’, floating above the city overlooking KLCC tower sunset. Priced from RM200 nett per person for half day inclusive of one coffee break and additional charge for up to 22 persons to enjoy a 3-course Dinner in the Sky. For more details, email: sales.imperial@sheraton.com or call +603 2717 9900. The refined luxury of The St. Regis Kuala Lumpur offers sophisticated event spaces and a cultured ambience for meetings and corporate gatherings. In addition to a Malaysian themed working lunch such as a Penang Street, Food Truck and Teh Tarik coffee breaks, a host of experiential themes may be added to create dynamic team building interactions or CSR initiatives. The hotel’s meeting expert can curate one-of-a-kind experiences including keynote addresses from celebrities and cultural experts, or engaging activities such as batik drawing and Chinese calligraphy. The full day meeting package is priced at RM340+ per person with a minimum of 20 participants. For more information, contact: Events.kualalumpur@stregis.com or call +603 2727 1111. Bedecked in Batik motifs and traditional kampung decorations, meetings at The Westin Kuala Lumpur evoke a nostalgic spirit of Malaysia. ‘The Flavours of Malaysia’ theme reflects the nation’s diverse cuisine and culture with live action stations highlighting famous dishes of the country and Malaysian style back to school concept with blackboards, exercise books with wooden table and chairs. The teambuilding package, “Pots, Pans and Palates” offers authentic Malaysian cuisine and culture through local market visits and cooking of local recipes. The theme is incorporated into the full day meeting package, customized dinner, and outside catering services. The full day meeting package is priced from RM250 nett per person for a minimum group of 20. To make a booking kindly email: sales.twkl@westin.com or call +603 2731 8333. The new urban lifestyle hub of W Kuala Lumpur is set to reimagine meetings in the city with a bold new experiential approach to business-focused events. With the themed “Blast from the Past: A Malaysian Heritage“ package, planners are encouraged to break free from the everyday, with the unique meeting package designed to engage and inspire, offering an authentic taste of Malaysian heritage. The hotel’s RECESS breakout zones are transformed into a vibrant street food environment with delectable flavours served in time-honoured fashion, in traditional claypots, tiffins and rattan baskets. The package is priced at RM290+ per person for full day meeting and RM270+ per person for half day meeting with a minimum of 20 persons. Contact: sales.wkualalumpur@whotels.com for further details or call +603 2786 8888. Sheraton Petaling Jaya Hotel injects a touch of fun into destination meetings with a ‘Golden Malaya’ theme designed for a more absorbing experience. Guests will enjoy playful sweet selections like Asam-boi Candy and White Rabbit Candy, and the usual writing pad will be replaced with local exercise book, Buku Latihan and pencil to reminisce the good old days in Malaysia. During the welcome, morning and afternoon breaks, an enticing array of local street snacks will be served up including roti putih bakar, nasi lemak bungkus, Malaysian ice cream and more. The package is priced from RM210 nett for a full day meeting and from RM190 for a half day meeting. Email: sales.spj@sheraton.com for more information or call +603 7622 8888. Corporate gatherings can easily be transformed into a mouth-watering multi-cultural affair with Four Points by Sheraton Puchong’s Malaysian themed meeting package, showcasing specially curated Muhibbah menus. Featuring an Indian, Malay and Chinese themed coffee break with Muhibbah inspired decoration, it also encompasses an engaging live action stall and food demonstration. Celebrate Malaysian diversity in your next meeting at the hotel’s Puteri grand ballroom, Putera meeting rooms or alfresco by the poolside. Prices start from RM168nett per person for a full day meeting and from RM148nett for a half day meeting. For more details, email: sales.puchong@fourpoints.com or call +603 5891 8845. Le Méridien Putrajaya Hotel’s Malaysian themed package is a delicious departure from the usual staid corporate events and is an ideal teambuilding concept. Batik painting and traditional games such as congkak are just some of the activities offered in the interactive coffee break area. Furthermore, the hotel’s talented chefs will demonstrate the art of making the perfect Teh Tarik or how to skilfully wrap nasi lemak. The package comprises a choice of three menus showcasing quintessential Malaysian delicacies such as Satay, Char Kueh Teow and Nyonya kueh. The full-day package is priced at RM220 nett per person whilst the half day package is priced at RM200 nett per person. Email: lemeridien.putrajaya@lemeridien.com for more information or call +603 8689 6888. Pristine coral reefs and rainforests dot the Langkawi coastline, offering unmatched opportunities to impress guests with inspiring outdoor meetings and functions. A range of captivating settings, comprising tropical themed board meetings or a beachfront sunset cocktail reception, can be incorporated. Langkawi destination meetings are also rewarding and sustainable and offer the perfect opportunity for additional conservation-based CSR and teambuilding activities. Key corporate gatherings deserve an inspiring setting. The Andaman, a Luxury Collection Resort, Langkawi presents stunning outdoor venues, exquisite food and thoughtful amenities nestled within pristine reef to rainforest scenery. For a limited time only, bookings receive a host of special inclusions and benefits, including a special room rate starting from RM700 nett per room per night, complimentary 30 minutes Santai drink session before dinner and complimentary ‘Indigenous’ welcome amenity for all delegates. Take part in the indigenous teambuilding activity for a unique experience with the Rainforest Master Chef or Coral Conservation. Prices start from RM230 nett per person for a half day package and from RM250 nett per person for a full day package. To make a booking, kindly email: sales.andaman@luxurycollection.com or call +603 2717 9972. A vibrant outdoor street food concept comes to The Ritz Carlton’s luxury beachfront oasis in Langkawi, showcasing authentic local flavours with the Dulang lunch. Meetings take on a whole new adventurous tone with a bounty of eclectic local dishes to sample, Malaysian themed coffee break stations and a theatrical staging of the Teh Tarik tea pulling ceremony. Elevate a business gathering even further with an impeccable Warisan Dinner rounding off a productive day with barefoot beach dining under the stars. The full day package is priced from RM275 nett per person whilst the half day package is priced from RM250 nett per person. Contact: reservations.langkawi@ritzcarlton.com or call +604 952 4888.
Business events and corporate retreats go beyond expectation at The St. Regis Langkawi. In graceful indoor venues and among captivating tropical scenery, bespoke experiences unfold. The resort curates extraordinary locally-themed moments for business gatherings encompassing the St. Regis Night Market Buffet Dinner with cultural performances by Beringin Dancers. In addition to enticing local flavours and Malaysian inspired meeting setups, further curated enhancements can be added for a truly memorable experience with more activities. These include learning Silat, the traditional martial arts, treasure hunt teambuilding Harta Karun style, and outdoor activities with local villagers or rice farming, to name a few. The full day meeting package is priced at RM250 nett per person and the half day is priced at RM230 nett per person for a minimum of 10 persons. To make a booking, please email: events.langkawi@stregis.com or call +604 960 666. Music, art, food, nature and heritage combine to create a true Malaysian ambience for corporate meetings and conferences in an inspiring setting in tropical Langkawi. Welcomed by the famed Kompang tradition, each meeting guest can embrace unique Malaysian flavours served by associates in traditional costume, enjoy local coffee breaks and gala dinners with live stations, indigenous door gifts and an array of optional activities, from kite making to traditional dance. The full day meeting package is priced at RM230 nett per person and the half day meeting package is priced at RM200 nett per person, based on a minimum of 10 persons. Email: westin.langkawi@westin.com or call +604 960 8888 for further details or to make a booking. Experience the best of Southern Malaysian hospitality in vibrant Johor Bahru (JB). Well connected to Malaysia’s major urban centres and easily reached from Singapore. there is a flourishing business community in JB. The region is also Malaysia’ s foremost regional leisure and lifestyle destination, offering numerous additional elements to engage meeting guests with theme park visits, nature, golf and more. The Johor Indigenous meeting package showcases Johor State’s signature cuisine and thoughtful Malaysian hospitality. Convene a meeting at Renaissance Johor Bahru Hotel for a seamless event experience accommodating up to 1,200 guests. The package is inclusive of an international buffet lunch at BLD Café, presenting tempting local delicacies such as Laksa Johor, Mee Rebus, Gado-gado and Lontong. Delegates will also enjoy coffee breaks with a range of delectable snacks and engaging live action stall. The full day meeting package is priced from RM170 nett per person. Email lanise.loo@renaissancehotels.com or call +607 381 3317 to make your booking. Give meeting delegates the opportunity to discover the fascinating contrasts of Borneo’s Rainforest City, Kota Kinabalu. A bustling city with all the modern amenities required for innovative business gatherings, it nevertheless unlocks the accessible, captivating nature of rainforests and indigenous wildlife. Meetings can be elevated with ease, incorporating elements of rich Sabah culture and nature-inspired experiences. A true flavour of Sabah cuisine and culture is sure to invigorate any business event. Kick off a meeting at Le Méridien Kota Kinabalu with free flow of refreshing Sabah Tea and Kopi Tenom. Elevate the coffee break with a menu upgrade featuring an interactive live station of local specialties with a twist including roti kahwin, chicken bambangan in bamboo, banana fritters with cheese and tapai with vanilla ice cream. The Sabah-inspired full day meeting package also features immersive elements such as complimentary traditional Rungus beads garland for groups of 50 or more. For larger events (minimum 300 persons) the Sabah cultural show is the perfect way to ring in any event in style. The meeting packages are priced from RM210 nett per person for full day and from RM160 nett per person for half day, with a minimum of 30 persons. For more details, email: 01935.salesmarketing@lemeridien.com or call +608 8322 222. Whatever the size or complexity of a business gathering, the engaging spaces at Marriott International hotels and resorts in Malaysia are designed for success. Explore the varied options throughout Malaysia for a corporate event, seminar or business meeting. These specially curated meeting packages are available from 7 September to 31 December 2018. Start planning by visiting the website http://bit.ly/mymeetingsmi and book by 15 December 2018 to receive a host of enticing benefits.